Where’s UMKC headed in the next five years? Forward. Introducing the road map to success: the new UMKC Strategic Plan. Pillar 1: UMKC will provide exceptional student learning, success and experience. Pillar 2: UMKC will become a thriving discovery enterprise. Pillar 3: UMKC will transform our community and region with impactful engagement. 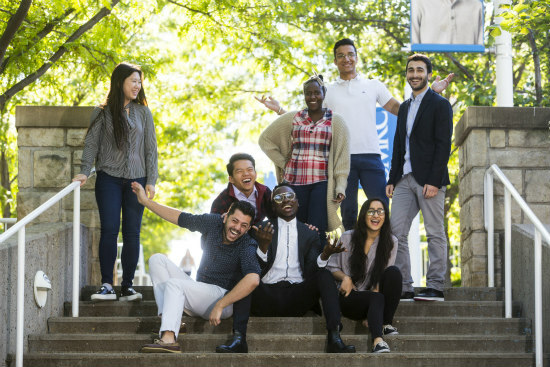 Pillar 4: UMKC will foster an environment of invigorating multiculturalism, globalism, diversity and inclusion. Pillar 5: UMKC will develop strong and resilient people, processes and physical infrastructure. For enrollment, we need to grow from our current base of about 16,000 students to 20,000 in five years, an increase of 25 percent. We want to reach 24,000 after 10 years, a 50 percent increase from today’s baseline. Our six-year graduation rate for first-time college students is a shade under 50 percent. We need to get to 60 percent in five years, and 68 percent in 10 years. Our university spends about $29 million per year in research grants. Our goals are a 50 percent increase over the next five years, and by 2028, to more than double the current figure, to about $60 million. Fewer than half our students engage in service learning before graduating. The goal is to raise that figure to 75 percent in five years, and 90 percent in 10 years. In order to provide exceptional student learning, success and experience, the plan calls for increasing on-campus housing capacity; reducing student cost of attendance; investing in advising and support programs to provide consistent and expanding services to support students from enrollment to graduation, particularly minority and lower-income students; and expanding our onboarding and bridge programs to help first-time college students get used to the more intense demands of higher education. The new UMKC Strategic Plan took people many hours in strategic sessions, and Agrawal thanked everyone for their time and thoughtful contributions.